Today we launched a number of updates that includes customization to Botler, an updated analytics dashboard and a new contacts page to expand Hoperator's CRM capabilities without a Property Management System integration. Once you select "Website Embed" from the menu, you may notice that the section navigation has changed slightly. By selecting "Configure Botler" you have the ability to add a custom profile photo and use the default welcome message or enter your own. In the "Advanced Settings" we have added the ability to make a contact field required. By selecting this checkbox when a website visitor starts a chat they will be required to enter their email address or mobile phone number (if you have an SMS plan). Our new contacts feature allows you to create contacts from conversations. 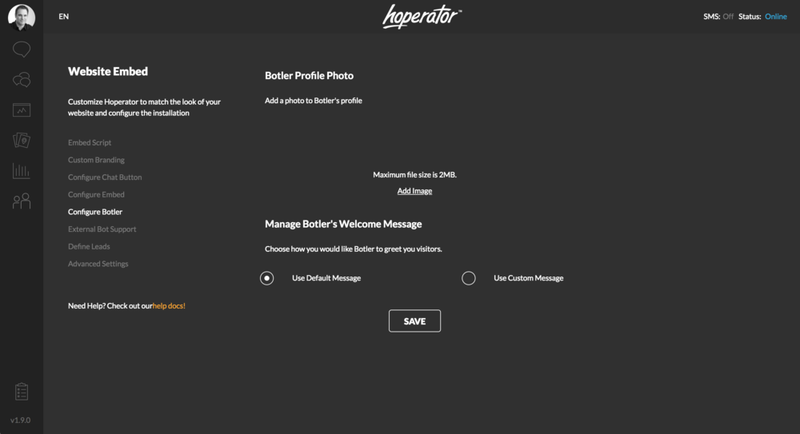 When a visitor submits contact data such as an email address or mobile phone number, Hoperator automatically saves the information in the contacts section. From the contacts section you can manually send communication to a contact via email or text message from Hoperator. This way you can create a contact database without a Property Management System integration or (coming soon) import .csv files that have been exported from your Property Management System or any other CRM or contacts database. Access contacts from the left navigation panel. We will be adding additional functionality soon that will allow you to automated communication to these contacts based on custom criteria. Questions about any of these features? Just contact us!